Indie Retro News: Stranger Things - Hit '80's' style TV show but as an adventure tribute? YES! Stranger Things - Hit '80's' style TV show but as an adventure tribute? YES! You may or may not have watched Stranger Things on Netflix, but let me tell you it is one of the best TV shows of 2016. It has everything which made the 80's so good such as ET, Close Encounters, as well as JJ Abrams' Super 8 but ends up like a twisted Stephen King story set in a Spielberg universe. 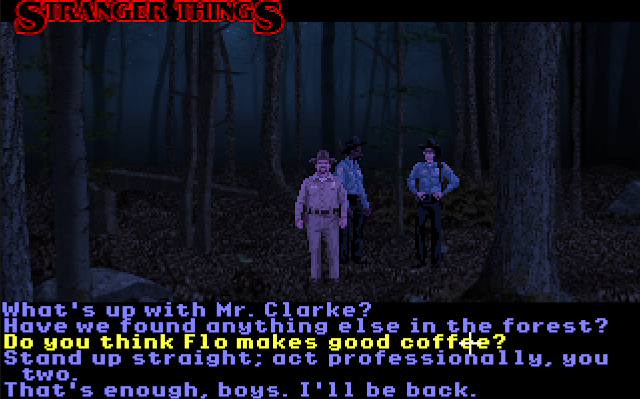 Me and my girlfriend were completely hooked pretty much right from the get go, so you can see why I'm dribbling down my chin to learn of a one-room, point and click adventure game, done in tribute to the series Stranger Things by none other than Infamous Quests, creators of Quest for Infamy and more! It doesn't matter if this is just a one room game based on an incredible TV series, but let me tell you, if you're a fan of Stranger Things, you just have to download it now. It is a perfect fit for the show and really pulls you in to a what if this was a full game. So a pat on the back for Infamous Quests as this tease is full of potential.